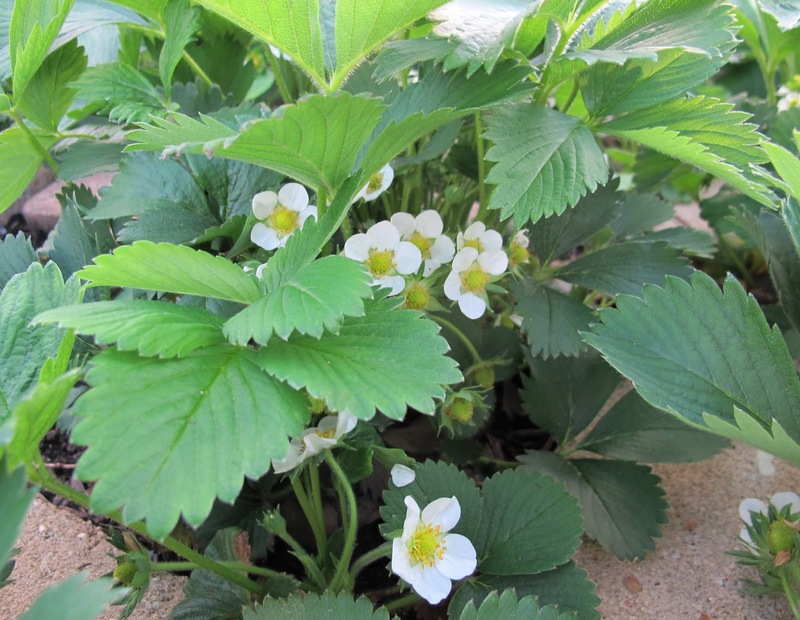 The bloom is on the strawberry and off the Korean Spice Viburnum. By golly, now that it isn't blooming, I think I can remove that Korean Spice Viburnum on the right side of the gate to the vegetable garden after all. It has a big dead branch in the middle and is right where I want to plant a new honeyberry. Then I'll move the other smaller Korean Spice Vibnurnum on the other side of the gate to someplace else in the garden. And when I say "I", I really mean the two guys I've hired to actually do this work. 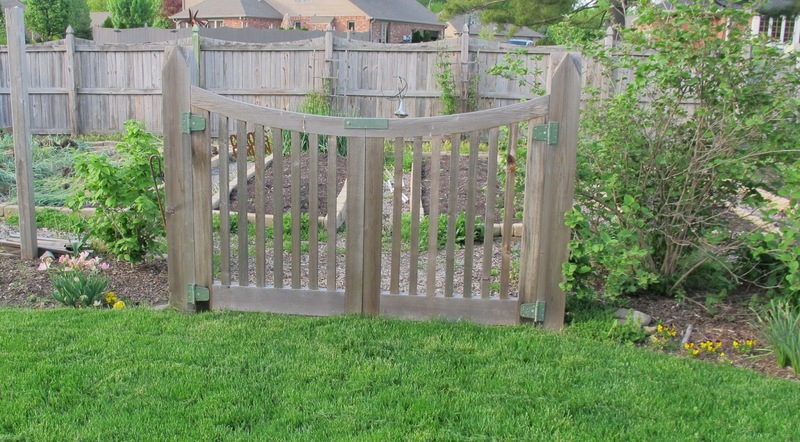 I think the two honeyberries will grow quickly to fill the spaces on each side of the gate and though the blooms won't be quite as fragrant as the viburnums, I will get edible fruit from the honeyberries. It's all part of my grand plan to grow more fruits around the vegetable garden. Last fall I planted three dwarf apple trees on one end of the garden by the compost bins. Two springs ago I planted red and gold raspberries in a bed to the left of the gate. And 15 years ago I planted grapes in the bed to the right of the gate. Plus, I have strawberries, and they are blooming. One viburnum I'm not planning to remove is this big bertha viburnum, Viburnum opulus 'Sterile' on the other side of the grape arbor. 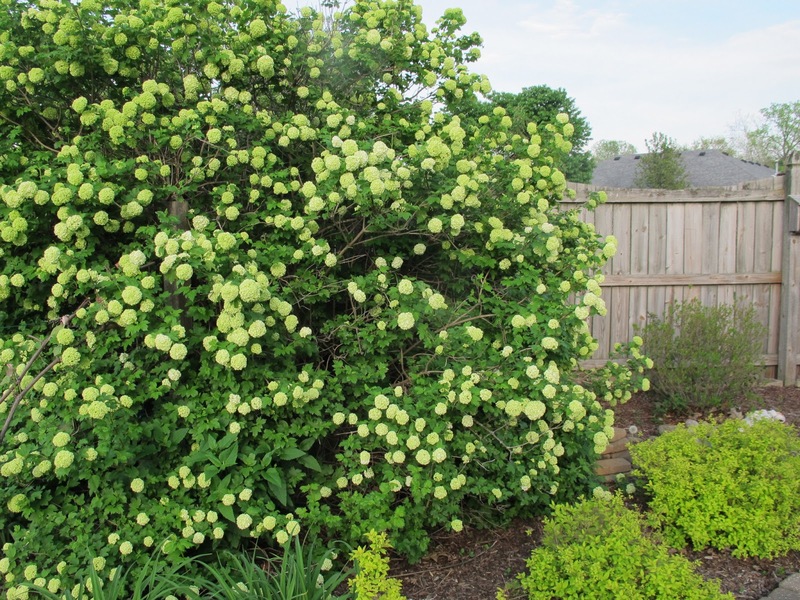 This big shrub provides shelter for all kinds of birds and hides the compost tumbler and compost bins. I also suspect that a family or two, maybe a village of rabbits live around its base. They can all stay there, as long as they don't eat the fruit of my vegetable garden. Sounds like a good plan and I look forward to your posts on the Honyberries. I just planted a VoS...yours is huge. I can only hope mine gets as big. Love those green pom poms. Good for you for more fruit. I would like a piece of honeyberry pie please. My viburnums are just in full bloom; well, the V. carlesii and burkwoodii, anyway. Others are waiting in the wings. 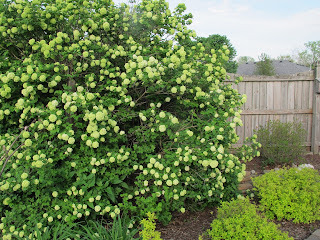 I love Korean Spice Viburnum! My mother loved the Viburnum opulus 'Sterile' and I think one still survives in the garden I inherited. Today I discovered it's name. Thank you. Yours is lovely and huge! I love to grow edibles, I've considered Honeyberries but they say they can bloom too early if there is warm weather in late winter, which happens here nearly yearly, so I would like to hear how yours do. How do blueberries do in your area? I have maybe 20-30 and they are great. I saw one insanely loaded with fruit in the nursery, Bountiful Blue. The berries I get the most from and easiest to pick is Aronia, top native berry for antioxidant content. There is supposed to be a dwarf form but mine, Viking, are 8' tall and wide. I've read some Viburnums have edible berries, like Nanny berries, but they sound like they have big seeds that would make them hard to process? Ditto for Nanking and Hansen bush cherries. Beach plums maybe have more flesh for the amount of pit? Have you tried any of these?